Member states urged the UN Human Rights Council to ensure justice is delivered on in Sri Lanka through a time-bound strategy, during today's interactive dialogue on the report by the Office of the High Commissioner for Human Rights, with Canada reiterating the call for international judges. Calling for a time bound strategy to fully implement commitments laid out in resolution 30/1, co-sponsored by Sri Lanka, Canada called on the country to "end impunity by enacting domestic legislation that criminalizes violations of international law without statutes of limitation" and "establish a judicial mechanism with special counsel to prosecute violations of international law with the involvement of international investigators, prosecutors and judges." "Justice demands that resolution 30/1 be implemented in its entirety. Canada urges the government of Sri Lanka to set a time-bound strategy for full implementation of the commitments it has made to its own people," Canada's representative, the MP Gary Anandasangaree told the Council in a statement. Urging Sri Lanka to adopt a time-bound strategy, the EU stressed that ongoing intimidation was not compatible with reconciliation. "While the EU welcomes the improvements in some areas in respect for human rights and fundamental freedoms in Sri Lanka, we urge the government of Sri Lanka to take immediate and sustained action to implement its commitments and institute a durable reconciliation process, including through building confidence by completing the return of occupied land, replacing the PTA and advancing the identified transitional justice mechanisms." "Also, the EU is concerned about the continuing reports of harassment or surveillance of human rights defenders and of victims of human rights violations. Intimidation of victims and activists is not compatible with the reconciliation agenda. The EU encourages the Government of Sri Lanka to adopt a time-bound implementation strategy and we welcome that this is reflected in the resolution." Expressing 'alarm' at the lack of progress on accountability, and supporting all the recommendations put forward by the High Commissioner, Switzerland called for the resolution to be implemented in its entirety. We welcome the efforts undertaken by the Sri Lankan Government since 2015, in particular its readiness to cooperate with the Office of the High Commissioner for Human Rights. Switzerland welcomes the opening of the Office for Missing Persons and the adoption of a law establishing a reparations mechanism. However, it remains concerned about delays in the implementation of reconciliation measures and regrets the total lack of awareness-raising measures to explain to the population the link between the treatment of the past, lasting peace and economic prosperity. Switzerland is also alarmed by the significant lack of progress in investigating serious violations of international humanitarian law and violations and abuses of human rights. Switzerland notes with concern that the provincial elections have still not been announced. With six of the nine provincial councils dissolved, the 13th amendment to the constitution has in practice become a dead letter. This calls into question the basic democratic principles as well as the credibility of the government's promises to strengthen the mechanisms of separation of powers between the central government and the provinces. For this reason, Switzerland particularly welcomes the decision of the Government of Sri Lanka to co-sponsor resolution L.1 at this session. We call once again to implement it in its entirety. Highlighting the lack of sufficient progress, Belgium called for the establishment of a special judicial mechanism to provide transitional justice. "My country is concerned about the lack of sufficient progress regarding transitional justice and the investigation of numerous human rights violations. Combating impunity and strengthening accountability and the rule of law are longstanding priorities for Belgium. We encourage the Government of Sri Lanka to make substantial progress over the next year in implementing a comprehensive transitional justice strategy with a clearly defined timeline, including for the establishment of a special judicial mechanism." Calling on Sri Lanka to renew its commitment to transitional justice and prevent further delays in order to gain the trust of victims, Iceland echoed calls for a special judicial mechanism to investigate war crimes and crime against humanity. "We also note with concern that virtually no progress has been made in investigating or prosecuting domestically the large number of allegations of war crimes or crimes against humanity collected by OHCHR in its investigation, and particularly those relating to military operations at the end of the war and call upon Sri Lanka to create a special judicial mechanism for this purpose. We believe that the lack of progress and evidence of backsliding shows that the situation of human rights in Sri Lanka should remain firmly on the agenda of the Human Rights Council and we urge the Government of Sri Lanka to fully and without undue delay implement all recommendations made in the present and previous reports of the High Commissioner." Expressing disappointment about the lack of sufficient progress the United Kingdom, which is one of the co-sponsors of the currently tabled resolution, reiterated calls for a time-bound implementation strategy. "As the High Commissioner’s report makes clear, much remains to be done to meet the needs and expectations of victims from all communities in Sri Lanka and we are disappointed that more progress has not been made. We continue to urge the Government to prioritise the steps required to deliver fully on its commitments in resolutions 30/1 and 34/1 and to develop a comprehensive and time bound implementation strategy. In particular, we encourage the Government to establish the full range of transitional justice mechanisms envisaged in resolution 30/1, deliver meaningful devolution through constitutional reform, replace the Prevention of Terrorism Act with human rights compliant legislation, and return all remaining military-held private land." Referring to the previous two year extension, Norway said it had hoped to see more progress especially on areas of transitional justice and accountability, and stressed that a lasting solution to the ethnic issue was needed. "Norway recognises the progress made under some of the commitments in resolution 30/1, such as the establishment of the Office of Missing Persons. Norway also acknowledges the important role played by Sri Lanka’s democratic institutions in the peaceful resolution of the political situation that arose in Sri Lanka from October to December 2018. However, after the two-year extension granted to Sri Lanka in 2017, we had hoped to see more progress, especially in areas such as transitional justice and accountability. Norway also emphasizes the importance of developing the draft counter-terrorism legislation in line with international standards. Today, ten years after the end of the war, the trust of minority communities in the process of reconciliation, accountability and human rights is being steadily eroded due to slow progress in fulfilling the commitments made under resolution 30/1. Further delay could prevent Sri Lanka from achieving a lasting solution to its ethnic issues. 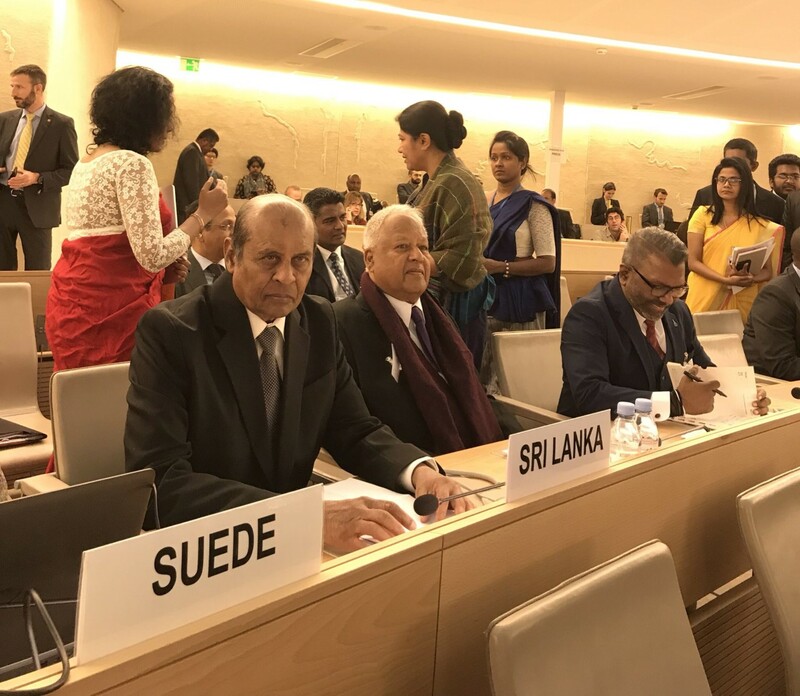 Norway encourages Sri Lanka to continue to address the serious human rights violations that occurred both during the conflict and in the aftermath." Aligning itself with the EU, Austra said it supported Sri Lanka remaining on the Council agenda, recognising "much more work needs to be done to promote truth-seeking, justice and reconciliation in Sri Lanka." "While we welcome improvements on a number of human rights issues in the country, progress in the government’s commitments to transitional justice has unfortunately been inconsistent and subject to considerable delay. Important achievements such as the establishment of the Office on Missing Persons and the Office for Reparations, and the national consultations have been neither adequately supported by the political leadership nor sufficiently linked to the accountability and truth-seeking components. This lack of decisive steps by the government to act on its previous commitments has generated widespread frustration. Austria therefore once again calls on the government of Sri Lanka to prepare a comprehensive strategy on transitional justice, with a time bound plan to implement the pending commitments made within the context of HRC resolution 30/1 and the recommendations made in the present and previous reports of the High Commissioner submitted to the Council." Drawing on its own past to stress that the process of reconciliation, goes hand in hand with accountability, Croatia called on the Sri Lankan government to end impunity. "While we note some progress in the field of human rights issues and Government’s engagement with the civil society, we are concerned about reports of cases of torture, sexual violence and other human rights violations including towards ethnic and religious minorities. We call on the Government to stop the impunity and ensure that perpetrators are brought to justice without delay." Echoing concern over intimidation of victims, Denmark said progress on transitional justice had been inconsistent and delayed. "Denmark notes the progress made in some areas by the Government of Sri Lanka on human rights issues and its engagement with civil society. However, progress in transitional justice has been inconsistent and subject to delay. Denmark agrees that to be successful, a transitional justice agenda must enjoy the confidence of victims and society at large. We are concerned about the continuing reports of harassment or surveillance of human rights defenders and of victims of human rights violations. Surveillance or intimidation of victims and activists is incompatible with the reconciliation agenda. We strongly encourage the Government of Sri Lanka to prepare a comprehensive and transparent strategy on transitional justice with a time-bound plan to implement the pending commitments made within the context of resolution 30/1." Reiterating the need for a time-bound strategy, Germany expressed concern about the Sri Lankan president's call for an end to the moratorium on the death penalty. "We are concerned about public statements on the enforcement of death sentences – despite Sri Lanka’s international commitment to the UN moratorium on the death penalty. We also share the concerns stated in the report of OHCHR: The country must ensure the replacement of the Prevention of Terrorism Act and review all cases of detainees thereunder. Transparent and reliable jurisdiction is a key to societal reconciliation, as we know in Germany. Closely observing these developments, we will continue to support Sri Lanka’s strong democratic institutions and recommend to the government to establish a comprehensive and time-bound strategy on transitional justice in order to implement its pending obligations." Adding to Germany's call to uphold the moratorium on the death penalty, Ireland said much remained to be done. "Although progress has been made, much remains to be done. We call on Sri Lanka to ensure that a full investigation into allegations of harassment of human rights defenders and prosecute those found responsible." "Ireland is concerned at proposals for a counter-terrorism law that include the possibility of the death penalty as a punishment. We strongly encourage Sri Lanka to uphold the moratorium on the death penalty and to consider the prohibition of the death penalty in all circumstances." Welcoming the OHCHR report, Liechtenstein said that whilst there had been some advances it continued to be concerned about the lack of sufficient progress on accountability and justice. "We share the High Commissioner’s concern about the slow rate of the progress in establish-ing meaningful transitional justice measures. This has engendered mistrust among victims and other stakeholders. Liechtenstein calls upon Sri Lanka to take necessary measures to fully implement the transitional process outlined in the Council’s resolution 30/1, especially in the field of criminal accountability where no substantial progress had been achieved. We would like to underline the importance of ensuring accountability in order to achieve a sustainable peace." Stating that it was important that upcoming elections in Sri Lanka did not slow down progress on the implementation of the proposed resolution, Montenegro, which had also co-sponsored the resolution, underlined the importance of accountability based on truth and justice. "We believe there is no alternative to reconciliation and appropriate addressing the issue of accountability, based on the truth and justice, and ensuring reparations for the victims. We still do not recognise a sufficient progress in this field and encourage the Government on more effective approach with concrete results." Comments by states came as Sri Lanka's foreign minister, Tilak Marapana, told the Council that it rejected the call for a hybrid mechanism, as detailed in resolution 30/1 which it had co-sponsored and which is due to be extended by another two years. The OHCHR report said that "virtually no progress" had been made by the Sri Lankan government on the investigation of war crimes, as well as highlighting concerns about ongoing torture and sexual abuse.